My wife, Gayle, is a watercolor artist. She creates remarkable paintings out of a collection of water-soluble paints. Her palette of paints, to my untrained eye, has a lot of similar colors. But to her, these individual colors all contribute something essential to her painting. Not only does she start with an initial palette but she mixes them to create custom combinations for a particular piece. Further, she layers individual colors on the painting to create additional nuance and texture. The whole process amazes me, particularly given that my artistry is limited to drawing stick figures. What she does as a watercolorist may seem remote and disconnected from today’s psalm, but it’s not. Her work is part of the vast array of vocations God has given human beings — in the language and metaphor of the creation story in Genesis 2 — “to till and to keep” the world in which he has placed us. It’s worth noting that the Psalmist is recalling that creation story by employing the same agrarian imagery. The phrase “to use” in this text has the same Hebrew root as the phrase “to till” in Genesis 2:15. The phrase “to till” reminds us of the proactive relationship between our faith and our work, and between our work and our world. We are all to be active agents in our world, not mere caretakers. Tilling also means that our faith is more than decorative to our work. My friend Steve Garber insists that our vocation is integral — not incidental — to God’s work in the world. Consequently, our faith is integral — not incidental — to our work. That’s hard work that requires us to be at our best. Which brings me back to where we started. 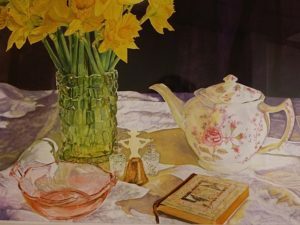 The complex and nuanced work of a watercolor artist reminds me of the importance of learning how to faithfully engage my work with a skillful use of the “palette of colors” of my vocation. Too often, it is easy to look for simple solutions to complex problems — using a few primary colors when a larger palette or a more nuanced layering of colors is necessary. And, sometimes, difficult work requires painful choices. As a friend in leadership once said to me, “Your choice in this instance isn’t between ‘good’ and ‘bad’, but between ‘bad’ and ‘worse’.“ Darker colors and shading are often required to make a great painting. Tilling faith requires us to love and engage the world as it is. But, it also implies that we have a significant, positive contribution to make. We are here to create beauty, to speak truth, and to bring genuine goodness in our work to a world that is increasingly used to their absence. Do you consider your vocation integral to God’s work? If so, how is it integral? If not, why not? Likewise, do you view your faith as integral to your work? Why or why not? How do you till your faith? What painful choices have you had to make that have helped you do so? We are grateful, God, for the gifts you give us to fulfill our vocations. As you have created a palette of colors for artists, so you have given us the raw material with which to creatively engage our vocations in the world, to till the ground of our work and our lives. We are thankful for the gifts of wisdom and discernment given by your Spirit that help us navigate the complex and nuanced aspects of our work. Help us to do the hard work of discernment. Help us to engage our communities of faith to wrestle with the challenges that leave us perplexed. Help us to take seriously the resources of the wisdom of the Scriptures and of those who have preceded us as we wrestle with the unique challenges of this generation. Let us not settle for simplistic answers to our most difficult problems. Give us courage to follow your Word and your Spirit where they lead us. This post originally published on November 8, 2015. For those attempting to share this lovely reflection by Uli Chi on Facebook, we are experiencing a bit of a glitch. The Facebook link says “Page note Found,” but if you click through the link, the page can indeed be found. Please be aware of that when you share; you may want to make a comment to that effect so that those you share with don’t miss out. Thank you for this post today. In 2 weeks, I will be moving to a new city and new lifestyle with my husband, and looking forward to discovering what my work will be there. Being patient and open to God’s calling for me there is both exciting and challenging.